Philips, a world-wide leader in automatic external defibrillators, produces a wide range of AEDs suitable for all users and situations. Philips AEDs are known for their intuitive design and leading technology that can administer a shock in only eight seconds. 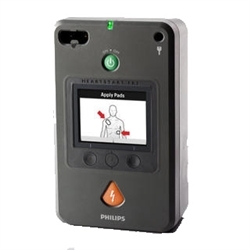 HeartSmart carries all models of Philips AEDs including the HeartStart OnSite , Philips HeartStart FRx, and HeartStart FR3. The Philips Heartstart FRx AED was made for anyone that gets to an emergency situation first. It features a user friendly interface with a lighted, easy to read dashboard showing useful visuals corresponding to the step-by-step voice instructions. The HeartStart FRx also includes special training pads to prepare anyone to use the defibrillator. This AED uses an optional pediatric key unique to Philips, for children under 55 lbs or 8 years of age. This makes it possible to use the same pads for children and adults, avoiding the need to replace child pads every 2 years. The HeartStart OnSite AED is specially designed to be as easy to use as possible for an untrained individual. It is the only AED available without a prescription. By simply pushing the on/off button or pulling the handle, easy to follow audio guidance for on-site coaching is started. It tailors its responses to the user’s activity, making sure that the guidance doesn't get ahead of the user. Another one of our favorite features is its self-test capability. It automatically runs over 80 tests every single day to verify that it is prepared for use. This relieves you from needing to run your own tests on the system. Because of the system’s portability, ease of use, and proven technology, this particular AED is ideal for the most situations and users. 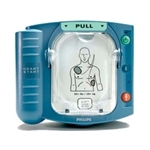 It is also the most affordable AED from Philips. The HeartStart FR3 AED is more advanced than other Philips AEDs and is intended for use by trained professional responders. It is one of the smallest, lightest professional AEDs to be found on the market. The FR3 is built primarily for two things – speed and effectiveness. To reduce deployment time, Philips implemented an automatic start system; it automatically powers up when the case is opened. 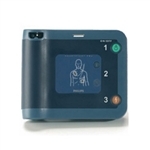 The FR3 is available with optional real time ECG and manual shock ability. By providing patient-specific guidance, the rescuer can provide the correct treatment faster. As with all Philips defibrillators, it also has the ability to download event data and seamlessly transfer vital information to cardiologists to support post event care and facilitate reviews.